Grecotel’s Agreco Farm gives a whole new meaning to ‘real experience.’ On a 4-hectare estate near Rethymno, Crete, the traditional farm showcases centuries-old farming methods. The farm provides a fascinating insight into the organic production of the island’s simple and healthy food – a must for any visitor to Crete. Shaped by hand, every stone at Agreco preserves the delicate balance between man and nature. The farm and its buildings stand in perfect harmony with the landscape. In the farm you will find an Olive Press, a Watermill, a Wood-burning Oven, a General Store, a Wine Cellar, Workshops, a Church and Guesthouses. No trip to Agreco would be complete without a visit to the farm’s Taverna, where a sumptuous six-course menu of Cretan dishes, based on the farm’s organic produce. On a hill with vine yards and olive trees overlooking the infinite sea, you will taste the very best of traditional Cretan cuisine. Only fresh, organic farm produce is used in the menu and the preparation is done entirely in the farm kitchens. Take home farm-produced products including organic olive oil, wine, olives, honey herbs and the new range of fragrances & body care products. 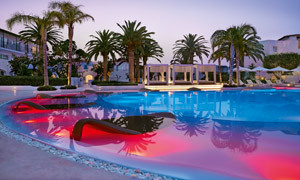 Eau De Grece - Agreco products are also available at all Grecotel hotels. 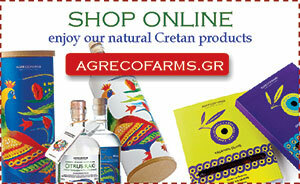 Agrecofarms.gr mission is to provide customers high quality organic, certified, Greek food products and body care products, from small productions, with local producers personal care. Play “Farmer for the Day” in Agreco farm and learn just how it feels to make and eat home-made traditional Cretan food. Simply nowhere else in Greece can you ‘live life’ on an organic farm. A luxurious collection of fragrances and body care products that are the essence of Greece - Eau de Grèce collection created exclusively for Grecotel. Just for You! Don't miss a unique culinary experience, tasting diverse seasonal dishes based on the fruits of the land and the legendary nutritional Cretan cuisine. 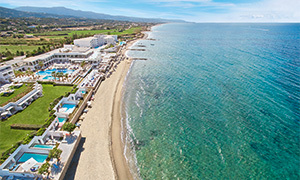 A relaxed-paced heaven for all inclusive family bonding holidays in Crete. Greek Island life and chic Mediterranean hideaways are the inspiration for this unique resort perched on the Rethymno Riviera.